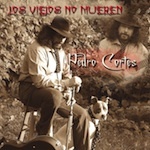 Pedro Cortes is from a family of Spanish Gypsy guitarists and grew up both in Andalusia and New York City, where his father came to for performances at the Spanish Pavillion at the World's Fair. He began his studies with his father and the esteemed Flamenco guitarist Sabicas, one of the four most influential figures in the history of that instrument. Touring as a professional Flamenco guitarist since the age of 17, he is now gaining recognition as a composer with influences that expand the Flamenco tradition, including from the classical, Latin, rock, and jazz worlds. As a composer, his En la oscuridad de las minas played at the Teatro Albeniz in Madrid, and other works were premiered by the Carlota Santana Spanish Dance Company at the Joyce Theater in New York. He haswritten two books on Flamenco, El Dron del Faraon and Cruzando el Charco, published by the American Institute of Guitar. Mr. Cortes, was commissioned by the Cohen Brothers to compose music for the film Paris Je T'Aime and has written soundtracks for HBO. He was Musical Director with the Guthrie Theater In Garcia Lorcas BODAS DE SANGRE. As a flamenco guitarist, he toured with Jose Greco and Maria Benitez, La Conja and performed with Farrucita, La Tati, Merche Esmeralda, Manolete and the great late Lola Flores. He has been guest artist with the St. Louis Opera and the New York Grand Opera, and has been commissioned by the Guthrie Theater.